Tomaquag Museum Tomaquag Mentioned in NY Times Article " A Preserved Kayak Floats an Exhibition in Alaska"
An overview of a sealskin kayak going on view at the Alutiiq Museum in Kodiak, Alaska. An oiled sealskin kayak made around 1850 by Alutiiq artisans in Alaska spent decades largely forgotten in storage at Harvard’s Peabody Museum of Archaeology & Ethnology. The newly restored vessel has been shipped to the Alutiiq Museum in Kodiak, Alaska, for a 10-year loan. It goes on display next Friday. Wall texts will explain how Alutiiq women traditionally used sinew and yarn to sew animal skins around kayak frames. Men carved the frame components from driftwood and lashed them together with strands including spruce root fibers. For sea voyages, the boats were stocked with food, water, amulets, kneeling pads and tools for fishing, hunting and making repairs to the exterior skin. Paddlers wore hooded jackets, made from animal intestines that were fastened to the kayak’s hatches. Children sometimes traveled along, tucked around the feet of their fathers. During storms, kayakers tethered their boats together for safety. 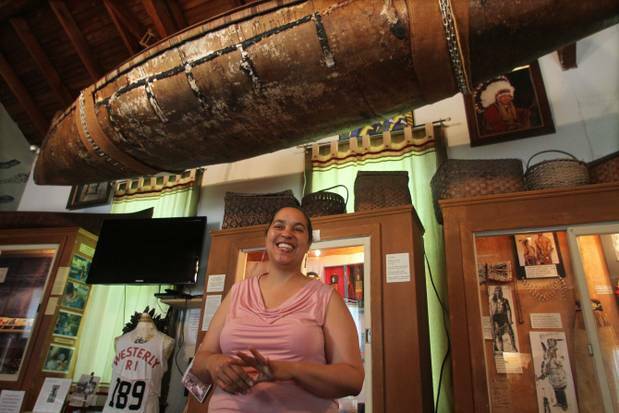 Executive Director, Lorén Spears of Tomaquag Museum, in Exeter Rhode Island stands in front of a Traditional Narragansett Birch Bark Canoe. A handful of similar boats survive elsewhere, including at the Kunstkamera, a museum opened by Peter the Great in St. Petersburg, Russia. A recent book, “The Alutiit/Sugpiat: A Catalog of the Collections of the Kunstkamera,” quotes the Russian explorer Yuri Lisianskii, who took home a sealskin kayak around 1805. In praising this kind of craft, he wrote, “I have never had a better rowing vessel.” Among other institutions with related displays are the Alaska State Museums in Juneau and Sitka; the Abbe Museum in Bar Harbor, Me., and the Tomaquag Museum in Exeter, R.I., which show birchbark canoes; the Lincoln Street Kayak & Canoe Museum in Portland, Ore.; and the Canadian Canoe Museum in Peterborough, Ontario.